Don't expect to see it on the roads anytime soon, but BMW has just unveiled some juicy details about its upcoming update to the luxury 7-Series line. 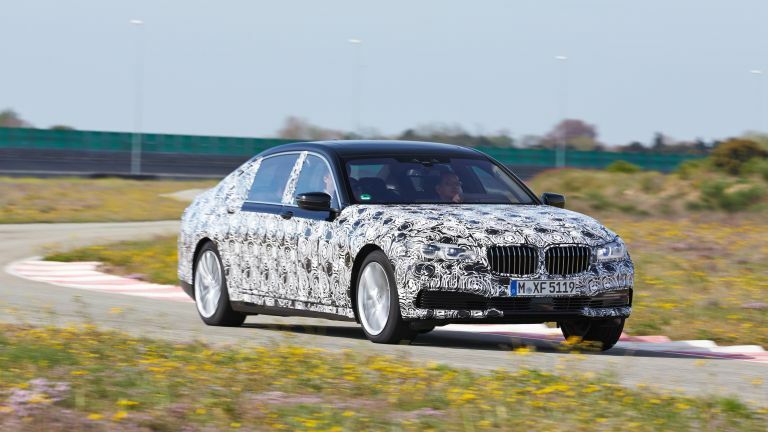 Currently at the prototype stage, the 2016 7-Series is an ambitious proposition from the German car manufacturer. It's aiming to be lighter, smarter, stronger and safer than previous incarnations while still packing some serious power under the hood. Taking inspiration from the brand's droolworthy i3 and i8, the updated 7-Series will use carbon fibre reinforced plastic in the structure of the passenger shell, reducing weight by around 130kg and improving fuel efficiency. Using this clever material will also add extra strength and rigidity to the chassis. iDrive has been BMW's in-car infotainment system of choice for a while now, but we have yet to see it utilise a touch display, with a controller instead being used as the main mode of navigation. The new 7-Series changes that, adding a fully touch-sensitive panel and a completely new method of interaction - gesture control. This will work thanks to the addition of 3D sensors, tracking your movements and using the results to operate the system. You'll be able to alter music, answer phone calls and so on, along with creating custom gestures for different functions. It sounds pretty awesome, though we've always found the idea of gesture control better than than the reality. Can BMW change our mind? We'll have to wait and see. It seems that BMW is sticking with its own software for the iDrive system, rather than offering up Apple's CarPlay or Google's Android Auto - a shame for some maybe, but hardly surprising. 3D gestures and touch sensitive displays are one thing, but the 7-Series doesn't stop there when it comes to tech fuelled advances. Possibly the coolest addition is remote control parking. As the name suggests, this will let you park the car in particularly tight spaces without being at the wheel using BMW's new Display Key. It might not be the fully autonomous car we've been hearing about, but it's getting there. Safety is another key area in the new 7-Series. BMW's Connected Drive has been improved with a Lane Departure Warning Assistant and the Active Cruise Control can now detect the speed restrictions where you're driving. A new generation of engine will provide grunt for the vehicle, with BMW's TwinPower Turbo tech and an 8-speed Steptronic gearbox. Comfort should see an improvement thanks to an updated Integral Active Steering System. Pricing details haven't been released yet and as you can tell from the unique paint job in the above pictures, BMW is still keeping many details about the design of the vehicle quiet. Though with a release pegged for later this year, we're sure to be hearing a lot more information soon.